Mike Pawlawski has enjoyed nothing but one of the more curious professional football careers. It all started back in 1992 when the highly decorated signal caller from Cal was drafted by the Tampa Bay Buccaneers in the 8th round. He spent one year with the team and the next two out of football. Mike reignited his football career when he joined the Arena Football League. First with the SabreCats, and then later with the Miami Hooters in 1995. (- Yes named after the Hooters restaurant franchise.) 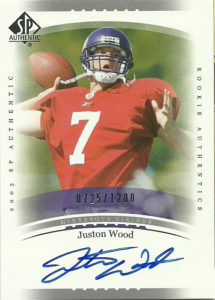 He played one season with the team (66/133, 674 yards, and 6 TDs) in primarily relief duty. 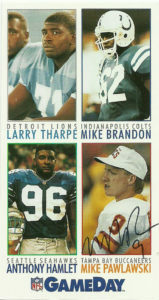 He also spent time in the CFL with their USA invasion as a member of the Shreveport Pirates. Mike jumped to the Albany Firebirds the following year- and really impressed (22/35, 296 yards, 5 TDs, 0 INT) in limited play. It’d be in 1997 that Pawlawski came into his own as a starter. He’d throw for 4,272 yards and 69 TDs on 509 attempts. For the next 3 seasons he’d be the unquestioned starter of the Firebirds and threw for at least 70 touchdowns in each year. He heard the siren call of the XFL in 2001 and joined the fledgling league and be the starting quarterback for the San Fransisco Demons. In the lone season for the league Pawlawski finished second to only Tommy Maddox in passing, while leading the team to the Million Dollar Game. With the XFL hemorrhaging money and with bad TV ratings, the league shut down after the lone season. Mike retired due to injuries and followed his passions for the outdoors, working on the show Gridiron Outdoors. He also does color commentating for Cal games for a variety of networks. Mike was kind enough to sign these three cards in about a month’s time, however I wish he actually had a sharpie handy as his autograph gets lost on these canvases. Okay, let’s forget about the shirt that Brett is wearing. It’s a one of a kind on a card though as I’ve never seen a curse word sneak through. Sage’s entry is not a pretty one here, but rarely are their photos ever exciting. It’s a pretty basic entry and not very risky. Kudos though for showcasing what matters: the certified autograph. I didn’t really like the cards out of this set, but for what it matters, you can still find hobby boxes of this set at an extremely reasonable price (2017), fattening up your collection by 7-10 autographs in each box. Brett Smith played for Wyoming from 2010-2013. Despite setting numerous records for the Cowboys including career offensive yards (10,390), passing TDs (76), career TDs (97), and most total yards passing in a game (640), he was not selected in the 2014 NFL Draft. He’d sign as a free agent with the Tampa Bay Bucs and later join the CFL as a member of the Toronto Argonauts, and then the Arena Football League with the San Jose SabreCats. 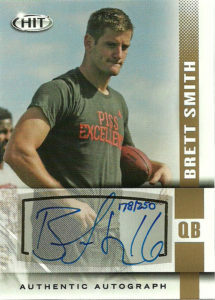 In 2015 Brett rejoined the CFL, signing with the Saskatchewan Roughriders. He’d win the 3rd string job, but end up starting a fair amount of the season, after injuries hit the quarterback position. Smith finished with a respectable 15 TDs to 9 interceptions on the season. After the season he spent time on the rosters of the Redblacks (2016) and Eskimos (2017). Currently he is a free agent.